Many passages in the Book of Mormon speak of it and other records being hidden up, often in the earth, in order to come forth to the world at a later time. According to John A. Tvedtnes, “The concept of hiding books for future generations to discover is [also] evident in a large number of early documents from the ancient Near East, whence came the peoples of the Book of Mormon.” The reports and legends contained in these documents stretch back to Adam himself. When two rabbis, upon reportedly discovering a record hidden by Adam, said that a divine power stopped them from fully reading it, another rabbi explained that God “does not desire that so much should be revealed to the world, but when the days of the Messiah will be near at hand … it will be revealed to all, as it is written.” In “an early Jewish text … Moses instructed Joshua on how to preserve the books (parchments) he was leaving in his charge … and [to] deposit them in earthen jars until the day of recompense.” The Dead Sea Scrolls (some of which were found in earthen jars) the Nag Hammadi texts, and a host of other discovered documents confirm that many ancient records really were preserved for future generations. The idea that the Book of Mormon was engraved onto golden plates and buried in a stone box, along with other sacred relics, was ridiculed by some people in the 19th century. Yet today, according to H. Curtis Wright, “literally thousands of metal documents” have been discovered from “all over the ancient world.” These include a variety of documents made from gold and gold alloys, some of which are from ancient America. The discovery of ancient hidden relics, many of them also made from precious materials, is also significant. Another seeming peculiarity of the Book of Mormon is that a portion of its plates were sealed. Legal scholar John W. Welch has pointed out that a number of ancient documents were also preserved in two parts—one part sealed and the other open—with both parts bound together in some fashion. These two-part documents were often legal in nature, validated by witnesses, and intentionally preserved for safe-keeping. These features have remarkable correspondences with the Book of Mormon. Mountains often symbolize temples or holy sanctuaries. Likely in relation with this theme, the Book of Mormon reports that several sacred revelations—including the Book of Mormon itself—were received, recorded, or buried in association with mountains or hills. Historical accounts indicate that many Nephite records were preserved in a hillside cave, and the Book of Mormon itself emphasizes that it would be “brought out of the earth” (Mormon 8:16). Joseph Smith said that an angel named Moroni had responsibility for the plates and led him to their buried location on a hill near his family’s farm (Joseph Smith—History 1:21–54). Many ancient documents were also found or reportedly hidden in mountains or caves. 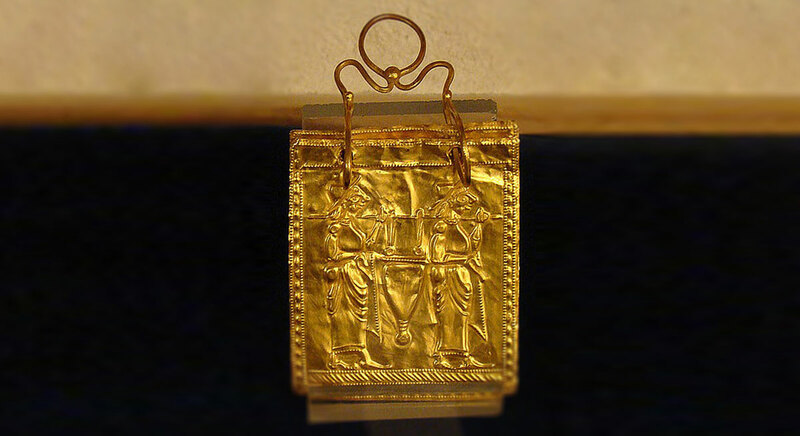 For instance, the The Cologne Mani Codex indicates that “an angel brought Enosh to a mountain and instructed him to write on bronze tablets and hide his record.” In Russia, “twelve small gold plates” were reportedly found “in a hill.” In the Masonic tradition, the prophet Enoch “inscribed his revelation on a gold plate that he concealed in a temple he constructed inside a mountain.” And in a number of ancient texts, buried or hidden records or relics were guarded by an angel or some sort of divine power. The large set of documents collectively referred to as the Dead Sea Scrolls were found in caves surrounding the Dead Sea. In ancient Mesoamerica, caves held deep mythological symbolism and were often considered to be sacred. In 2005, Holley Moyes and James Brady noted that “only in the last decade have caves been widely recognized as ritual spaces by Mesoamerican archaeologists. Since caves in Mesoamerica were used almost exclusively for ritual, they provide an unrivaled context for studying pre-Columbian religion.” The Book of Mormon’s emphasis on caves and sacred records coming forth out of the earth fits right in with these findings. Curtis Wright, “Ancient Burials of Metal Documents in Stone Boxes,” in By Study and Also By Faith: Essays in Honor of Hugh W. Nibley, Volume 2, ed. John M. Lundquist and Stephen D. Ricks (Salt Lake City and Provo, UT: Deseret Book and FARMS, 1990), 273–334. See 1 Nephi 20:6; 2 Nephi 27:12, 22, 26–27; 4 Nephi 1:48–49; Mormon 1:2; 4:23; 5:8, 12; 6:6; 8:4; Ether 4:3, 13, 15; 15:11, 33. See also, Book of Mormon Central, “What Were the ‘Other Records’ Nephi Saw in Vision? (1 Nephi 13:39),” KnoWhy 376 (October 26, 2017). Joseph initially wasn’t able to obtain the gold plates because his heart was not right before the Lord. After locating the record, he “tried three times to take them out of the box, but suffered progressively stronger shocks that deprived him of much of his natural strength, until he exclaimed in frustration, ‘Why can I not obtain this book?’” H. Donl Peterson, “Moroni—,” Ensign, January 1992, online at lds.org. It took four years before he was prepared to receive them. See Joseph Smith—History 1:53. See William J. Hamblin, “Metal Plates and the Book of Mormon,” in Pressing Forward with the Book of Mormon: The FARMS Updates of the 1990s, ed. John W. Welch and Melvin J. Thorne (Provo, UT: FARMS, 1999), 20. Although some examples of metal plates had been discovered by Joseph Smith’s day, it’s likely that knowledge of these discoveries was mainly held by educated scholars and not the general public. See William J. Hamblin, “An Apologist for the Critics: Brent Lee Metcalfe’s Assumptions and Methodologies,” Review of Books on the Book of Mormon 6, no. 1 (1994): 462–470. H. Curtis Wright, “Introduction,” in Tvedtnes, The Book of Mormon and Other Hidden Books, 20. See William J. Hamblin, “Sacred Writing on Metal Plates in the Ancient Mediterranean,” FARMS Review 19, no. 1 (2007): 37–54; H. Curtis Wright, “Ancient Burials of Metal Documents in Stone Boxes,” in By Study and Also By Faith: Essays in Honor of Hugh W. Nibley, Volume 2, ed. John M. Lundquist and Stephen D. Ricks (Salt Lake City and Provo, UT: Deseret Book and FARMS, 1990), 273–334; Paul R. Cheesman, Ancient Writing on Metal Plates: Archaeological Findings Support Mormon Claims (Bountiful, UT: Horizon, 1985); Paul R. Cheesman, “Ancient Writing on Metal Plates,” Ensign, October 1979, online at lds.org; H. Curtis Wright, “Metallic Documents of Antiquity,” BYU Studies Quarterly 10, no. 4 (1970) 457–477; Daniel Johnson, “Metals and Gold Plates in Mesoamerica,” BMAF presentation, 2010, online at bmaf.org; Franklin S. Harris Jr., The Book of Mormon: Message and Evidences (Salt Lake City, UT: Deseret News Press, 1953), 95–105; John A. Tvedtnes and Matthew Roper, “One Small Step,” FARMS Review 15, no. 1 (2003): 160–169; H. Curtis Wright, Modern Presentism and Ancient Metallic Epigraphy (Salt Lake City, UT: Wings of Fire Press, 2006). See Tvedtnes, The Book of Mormon and Other Hidden Books, 109–126. The reason additional relics are relevant is because the plates were preserved along with the Nephite interpreters and breastplate. And when the Three Witnesses were granted a view of the plates, they also beheld other Nephite relics, including the breastplate, interpreters, liahona, and sword of Laban (see Doctrine and Covenants 17:1). See Tvedtnes, The Book of Mormon and Other Hidden Books, 31–58. See Title Page; 2 Nephi 26:17; 27:7–21; 30:3; Ether 3:27; 4:5; 5:1; Moroni 10:2. See John W. Welch, “Doubled, Sealed, Witnessed Documents: From the Ancient World to the Book of Mormon,” in Mormons, Scripture, and the Ancient World: Studies in Honor of John L. Sorenson, ed. Davis Bitton (Provo, UT: FARMS, 1998), 391–444; John W. Welch and Kelsey D. Lambert, “Two Ancient Roman Plates,” BYU Studies 45, no. 2 (2006): 55–76. See Book of Mormon Central, “Why Would a Book Be Sealed? (2 Nephi 27:10),” KnoWhy 53 (March 14, 2016). See 2 Nephi 12:2–3; cf. Isaiah 2:2–3. See 1 Nephi 11:1; 1 Nephi 18:3; 2 Nephi 4:25; Mormon 1:3; Mormon 4:23; Mormon 6:6; Ether 4:1; Ether 15:11. A number of individuals claimed that Joseph Smith and Oliver Cowdery visited a cave that was filled with Nephite records and artifacts. However, it is difficult to tell, from these reports, whether the experience was in vision or whether they visited the cave in person. See Cameron J. Packer, “Cumorah’s Cave,” Journal of Book of Mormon Studies 13, no. 1–2 (2004): 50–57, 170–71. See Diane E. Wirth, “Revisiting the Seven Lineages of the Book of Mormon and the Seven Tribes of Mesoamerica,” BYU Studies Quarterly 52, no. 4 (2013): 77–88. Connie, there are many more unanswered questions about the entire restoration efforts of dear Brother Joseph than just the one you raised. Modern translations of the surviving particles of the papyrus purportedly used by Joseph to provide us with the information shared in the Book Of Abraham suggest that they were completely unrelated to the content displayed in our Pearl of Great Price, or PGP. Similarly, the content of the Book of Moses in our PGP was given by revelation with no recourse to other material except what is currently contained in our King James Version. To me, that is pure revelation. I can "see" in my mind how dear Joseph must have strained to get to the point where he could many times set aside the actual plates and depend entirely on the Holy Ghost to record what He, the Holy Ghost, and Mormon had prepared for us so long ago. Not having the luxury of a separate room or even a secluded "office nook" to where he could retire to perform his translation, it is quite easy for me to again see Joseph doing what he needed to do, even burying his face in a hat, to produce the knowledge required of him "lest he be destroyed". Overriding all of this is the counsel to "never assign a temporal reason to a divine action" - it is too big, even infinite in size. To translate from preserved documents or to sit knee to knee with the Holy Ghost to work out what the Lord would have us know is entirely up to Jesus Christ for His eternal purposes. It's big! I know that Joseph took the writings of a number of ancient prophets, preserved on gold plates, converted or translated them to English and his efforts have brought me closer to Jesus Christ. Thank you, Brother Joseph. I recently read the essay from the church about the translation of the Book of Mormon. I hadn't realized that the translation of the Book of Mormon occurred by Joseph placing is face into a hat and reading from a seer stone. In fact church historians have found that all of the translation of what is now the Book of Mormon was done by this method and the plates were not in the room with Joseph. I am wondering why the trouble of preserving the plates if they were not used to produce the Book of Mormon. Any thoughts?